Keeping up with the growing competition in the telecom sector, state-owned BSNL has now slashed internet rates for its data packs. Bharat Sanchar Nigam Limited (BSNL) has announced that it would offer up to four times extra data on its existing data special tariff vouchers (STV). 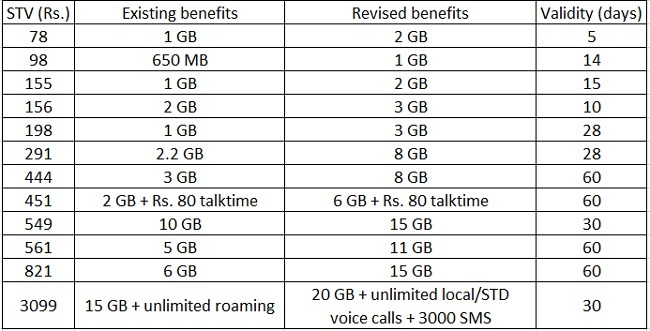 This would essentially bring down the cost per GB of data to as low as Rs. 36 when using the pack. The operator boasts that this rate is the lowest in the telecom industry. With the new scheme in place, customers purchasing the Rs. 291 STV will get 8 GB of data instead of the earlier 2 GB data benefit. Similarly, the Rs. 78 STV will now offer 2 GB of data instead of the earlier 1 GB benefit. The offer is applicable on STV priced at Rs. 78, 98, 155, 156, 198, 291, 444, 451, 549, 561, 821, 3099. The offer is valid till May 6, 2017.